There are a number of ways to help the bonding process with your gliders. They all have individual personalities and habits, just as we do. Different methods work for different gliders and their people, so it is best to have a selection of things to use. Bonding pouches come in various styles to keep your glider close to you, yet securely zipped in for safety. Play time interaction in a safe space such as a pop up tent, a glider proofed bathroom, or other small room works well for allowing the gliders to come up to you as they gain confidence. They are naturally curious, so sitting there reading or ignoring them is usually a sure way to have them climbing on you! Time, patience and repetition are key elements in the bonding process. We highly recommend purchasing a pop up tent with screen siding when bonding with your sugar gliders. This offers you a safe small area for you to spend time socializing and playing with your sugar gliders. They can run, jump, climb and use you as a jungle gym! When starting out, remove the whole sleeping pouch (with your gliders inside) from the cage, while securely holding the opening closed, and take them into the preset up tent. Carefully encourage them out of the pouch and slip the pouch out of the tent, or tuck it completely underneath you. This will prevent them from climbing back in to sleep, or trying to avoid you. Now you can use toys as stimulation, or even treats. You want them to explore and become comfortable around you. Often we've discovered reading a book aloud in the tent helps the gliders relax to your voice and often encourages their curious nature. After spending a half hour to an hour in the tent, slip the pouch back into the tent and offer it to your gliders. Generally, they climb in within a few minutes, allowing you to return them to their cage. If they do not return to the pouch right away do not worry. 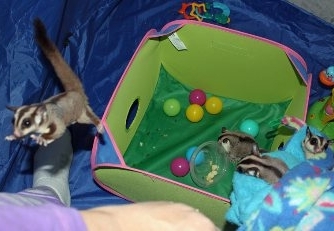 Remove anything they can sleep or hide in and leave the pouch on the floor of the tent, they'll get tired and climb in. Be sure the zippered tent door is always closed to prevent escapes. 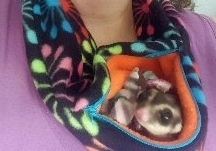 We've discovered a zippered bonding pouch is a very useful item when bonding with a sugar glider. When a sugar glider joey is born, it crawls up to a pouch on the mother's stomach, so we imitate this with their sleeping pouches and bonding pouches to create security. 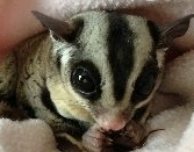 During the day while your glider is sleeping is a great time to take them out and place them into a secure bonding pouch. Keep them with you, touching them, talking to them and allowing them to smell you at intervals during the day. This helps them build trust and familiarity and become used to the sights, sounds and smells of home too. Even though they are mostly sleeping as you are moving around, they are hearing not only your voice, but other people, pets, equipment, the doorbell, and more. At first they may startle, or even crab, when hearing these things, but eventually they realize the noises aren't threats and that you are their "safe zone". Keeping them on you, but safely zippered into a comfy pouch with mesh allows for lots of learning. This is also the only way we recommend taking your gliders out of your home, because even a well bonded sugar glider can be startled and jump off their human, resulting in a tragedy. One thing we've learned with sugar gliders is that our hands seem huge, scary, and often look like monstrous teeth or claws coming when we reach toward them. By using treats we find they can learn our hands are not so intimidating. When approaching a sugar glider, as with any animal, you should always show them the back of your hand first. This is less intimidating and protects you from a serious bite. After you have shown them the back of your hand a few times, if they are not being aggressive, offer a treat. In the beginning, we recommend yogurt drops or a small snack (no meal worms), something that doesn't wiggle so you won't accidentally get bitten. Hold your hand in a fist with just your thumb and forefinger extended, slowly moving towards the glider from the direct front, so they see you coming. Speak softly to the glider while doing this, allowing them to approach you if they desire, smelling and exploring what you are offering. If they start to lunge or appear aggressive taking the treat, calmly pull back and approach again. They need to figure out aggressive behavior equals NO treat. This may take a few sessions of trying, but they will realize they need to calm down in order to receive a treat. Once they are taking treats gently, with no problems, then move up to the wiggly meal worms. Remember gliders get excited and may grab this prey treat quickly, but this is not aggression towards you, it's just excitement.